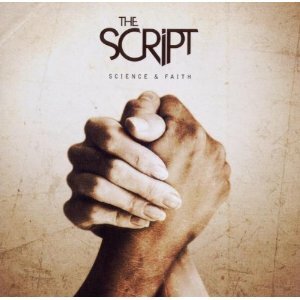 Review Snapshot: On Science and Faith, The Script have continued where they left off with their debut album. Catchy melodies, lyrics that you won’t need a dictionary to explain, and songs that won’t change the world. But I mean all this in the best possible way. Full Review: While the world waited for the “difficult second album”, the Script have played it safe and repeated what made them successful in the first place. Opening with a very long intro ‘You Won’t Feel A Thing’ sees the rockier side to The Script, with them sounding not unlike No Sweat did two decades earlier, while Danny sings “I’ll stand in front / I’ll take the blow for you”. The single ‘For The First Time’ (a recent Irish chart-topper) is typical Script, while the title track has an intro to match Bryan Adams ‘Cloud Number 9', which they may not thank me for. ‘If You Ever Come Back’ is brilliant in its simplicity. Any song that mentions ‘Key under the mat / ...Kettle on’ gives out a warm feeling. It’s a definite future single and without doubt the album’s standout track that’ll having you humming it continuously, and that’s one of their many strengths. There’s a change of musical direction on ‘Dead Man Walking’ where Danny and Mark aim at the American market with some R&B touches and rapping. This, along with ‘Walk Away’, both sound like My Town left-over b-sides. There’s no shortage of ballads here also, something the Script do well: ‘Nothing’ and the (Sting sound-alike) ‘This=Love’ are easy on the ear. Okay, so this album may not set the world on fire, and probably won’t please the critics, but the Irish trio have to be complemented for sticking to the script literally by producing material they’re happy with. And having fans like Paul McCartney who are we to criticise?